love that! with a little bit of time and fun fabric it could make for a wonderful weekend diy project. thanks for the inspiration! i agree! it would be really easy to customize them....and fun! 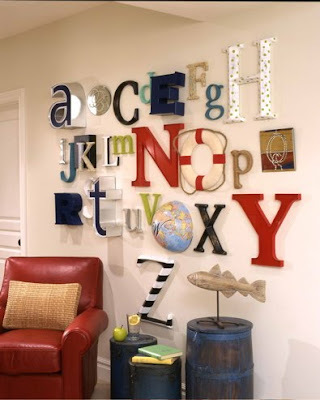 and i like how they used unconventional items like the half of a globe and the buoy as "letters" too! love the colours and all the different letters! I am the Direcrtor of ECommerce here at Jonathan Adler and I would be happy to check on your pillow for you. I can report that since inception custom textiles have been early to on-time in terms of delivery. In the interst of full-disclosure, it says on the "Design Your Own..." landing page to allow 12 weeks for delivery, but then in the FAQ's it says 12-14 weeks, I apologize for that confusion. Just so you know we are expecting a shipment in very soon and I would be happy to look up your order and report back to you if you like, please email me at customerservice@jonathanadler.com and I will get right on it. Thank you for using "Design Your Own..." Kristen and for being an early adopter. We are very proud of it and understand that it is a serious design tool and we hope it is lots of fun to use as well. it could make for a wonderful weekend diy project. thanks for the inspiration!